Thank you for serving our country. I am so proud of you and thankful to have you home. I missed you bunches. Babe I am so glad that you are home safe and sound. The kids and I missed you so much. We are so proud of you and love you so much. You are my Hero and I'm so proud of you. Thank you for being you and making our family proud of you. You were missed very much and I'm glad you're home. I love you bunches! Kyle, I miss you so much! I am super proud to tell people my brother is in the Army and I seriously respect what you do. I CAN'T wait to see you when you get home. We're so grateful to God for bringing you back safely and to YOU for all the sacrifices you've made! Welcome home! I just want to say "thank you" for keeping us all safe here and for your courage and bravery. I'm so very proud of you. Can't wait to see you! Welcome home. We missed you. We can't wait to see you. We are so happy you are safe...we can finally stop worrying. 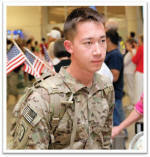 Welcome home Kyle , from the Beutel family and thank you for your service. I am excited to see you and your growing family together again. I am glad you are home safe and I am very proud of your for your bravery, strength and success with the Army. Keep up the great work and thank you for keeping our country safe and protecting our freedoms. To my one and only nephew. I am so proud of all your accomplishments and sacrifices that you have made for us as a family and this country. You should be so proud of yourself and what you have become...an independent young man, a loving father, husband and son. I love you with all my heart and I am so happy that you are FINALLY home! Now let's PARTY!!!!!!!!!!!!!! We are very happy that you are home! Thank you for serving your country. You should be very proud of yourself! It takes a special kind of person to do what you did for your country and for all of us!!!! Glad you are finally home! Take care! We are so glad you are home safe and sound. We are so proud and impressed with what a brave man and soldier you have become. It takes a lot as a person to give yourself so selflessly so that others may enjoy their freedoms!! We love you very much!! Even since we were kids, I have always looked up to you, and now, I couldn't respect you more. I am so proud of you, you've accomplished and experienced more than most people will in a lifetime. I love you and missed you tons. I'm thankful that your coming home safe. Finalllllllly! I hope your ready for allll of the hugs and kisses your about to get from us! Kyle, My family and I thank you from the bottom of our hearts for your service, selflessness, and bravery. We know it is not easy for you and your family. Our gratitude and prayers are with you always!!! Kyle, Ever since we were little we've had such a bond! You've always been there for me, and me for you! I can't think of 1 person (male) in the world that I love more than you! Can't wait to see you! Congratulations!! We are so proud of you!! We hear all about you and your family from your Mom who could not possibly be prouder, but I'm sure you already know that. It is awesome you have such family support and we are happy to do what we can as well!! Thank you so much for everything you do for our country! It is a lot of sacrifices to make and only few people are brave enough to do so. Thank You!! Welcome Home! I am very grateful that you made it back. I have missed you and I am very proud of you and all the accomplishments you have made. It gives me great pride when I talk to people and tell them that my son is in the Army. I look forward to seeing you and spending time with you. Thank you for the sacrifices you have made for us and our country. God Bless America! Kyle, Glad to have you back home safe and sound. We are so proud of you for the sacrifices you've made to make us safe. I know your grandfather would be proud of you. Welcome home and looking forward to seeing you and your family. Welcome home!!! Glad you are home safe and sound. We missed you so much! Thanks for all you have done for us and our country. We are very proud of you! Thanks for serving our country. I appreciate the sacrifices you make. Sorry I couldn't make your welcome home party. Welcome home cousin we're all glad you made it home safe. I just wanted to thank you for everything that you do overseas so we can live normal lives over here. I have so much respect for you and your mos. It's great that we got some time to hangout and catch up on things. Kyle, Thank You for your service to Our Country!! !